Fenerbahce’s match-fixing scandal is not a conspiracy. It is far from being a political issue. Fenerbahce is, by far, the richest club in Turkey and takes refuge to patriotism just like any pathetic scoundrel. However this ‘pulp fiction’ propaganda was soon, in a few weeks, replaced by a more improved one: a religious community, with antisecular agenda, was trying to take control of Fenerbahce club, supposedly the last surviving front of secularism in Turkey. There are much more tales that can be quoted. 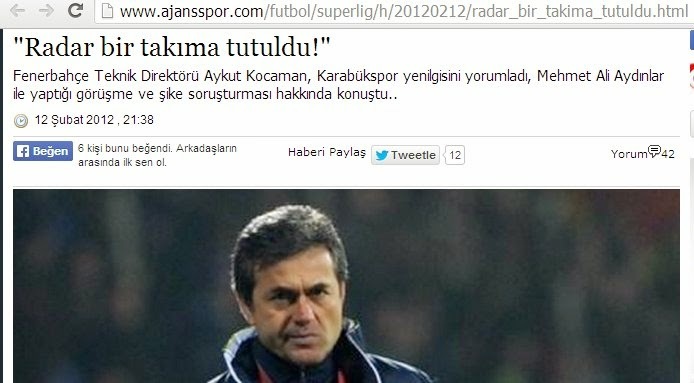 For example pro-Fenerbahce media even alleged that Miguel Lietard Fernandez-Palacios, the Spanish discipline inspector of UEFA, was trained in schools of this antisecular Islamic community (http://haber.sol.org.tr/spor/uefa-sorusturmasinin-altindan-da-gulen-cikti-haberi-75076). Let’s leave aside the numerous conspiracy theories and come to facts. As the most powerful club in Turkey, FSK had a strong say in drafting of the law. FSK lawyer and director Şekip Mosturoğlu, in a TV news show, said “We demand heavy penalties for football officials in the coming match-fixing law”. Under that law, he was convicted guilty of match fixing, but his sanction was decreased vastly thanks to a subsequent parliementary action that lightened the penalties to save FSK officials. In those days, no other club’s official had such a strong say or influence in mdrafting of the law. There is no such media or parliementary record.